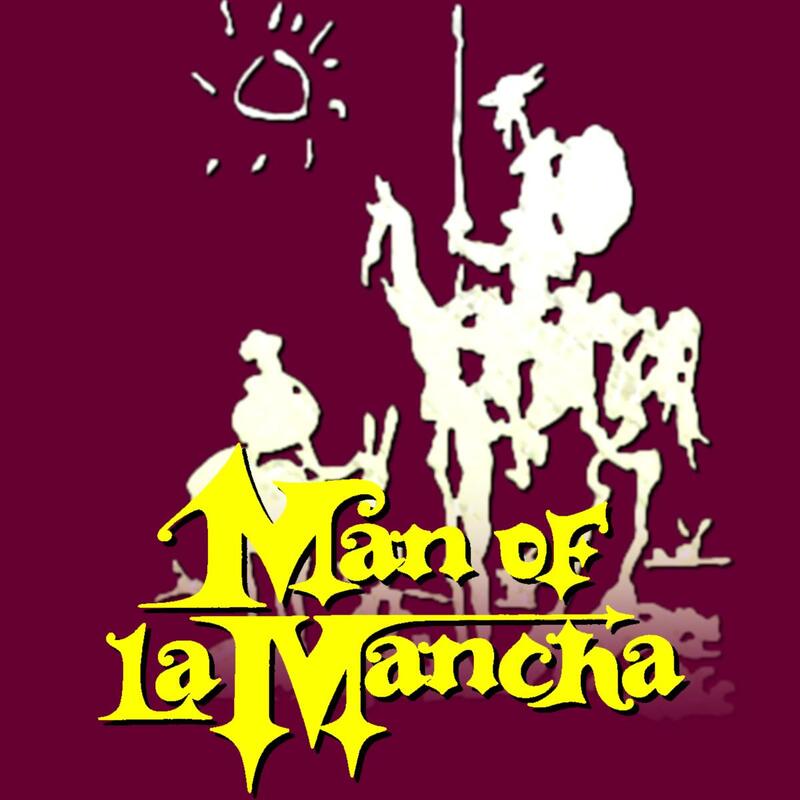 “Onward to glory” strides Long Beach California’s “Musical Theater West”, as they spur their 59th season up to full gallop with a first-rate version of “Man Of La Mancha“– the classic musical based on Miguel De Cervantes legendary tale. Right from the start, it’s apparent that once again this exceptionally talented group have been doing far more than tilting at windmills in their ‘quest’ to bring this timeless masterpiece to life. In fact, in the hands of Award-Winning Director Nick DeGruccio, the company delivers us a great big valorous valentine that doesn’t put a foot wrong. 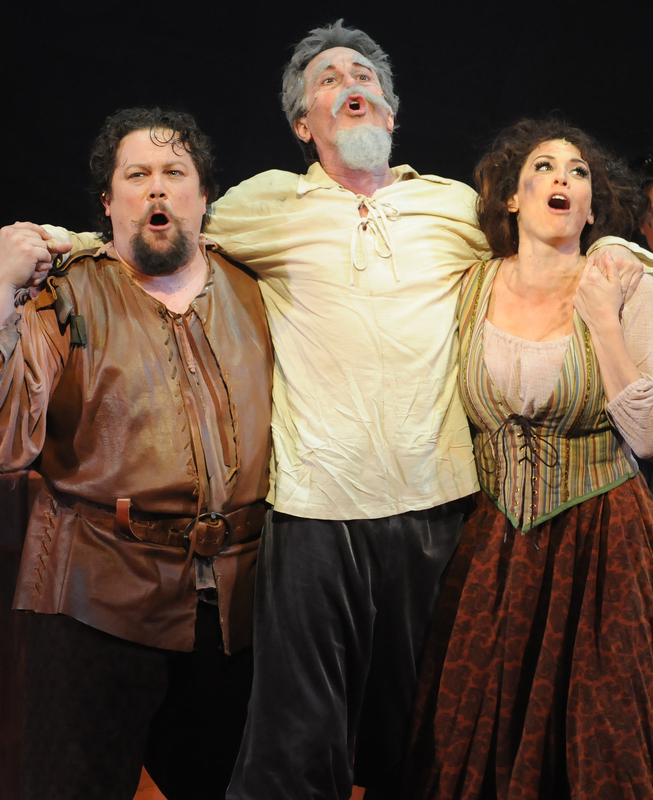 Dale Wasserman’s triumphant libretto encompasses a play-within-a-play, beginning at the harrowing height of the Spanish Inquisition. Immediately we’re in the common area of a cavernous dungeon packed with desperate, terror-filled people. There Cervantes and his manservant are thrown while waiting to ‘submit their persons for purification if so ordered” by the Inquisition tribunal. (You see, in order to make ends meet, the self-admitted author and playwright, temporarily took a job with the local tax collector, then had the appalling judgment to issue a lien on a church, while his hapless valet was the one stuck with actually nailing it to the door.) Before receiving their verdict upstairs though, they must first face their peers below, or forfeit a manuscript containing ‘the history of a certain aged cavalier‘–an unthinkable fate for this celebrated ‘Poet Of The Theater”. Fashioning his defense in the form of a “charade’ (or ‘entertainment‘,) he entreats his fellow detainees to ’enter in to my imagination”, transforming before our very eyes into “a country squire, no longer young, who has laid down the melancholy burden of sanity” to become instead, the notoriously brave, eternally idealistic, “Don Quixote De La Mancha“. 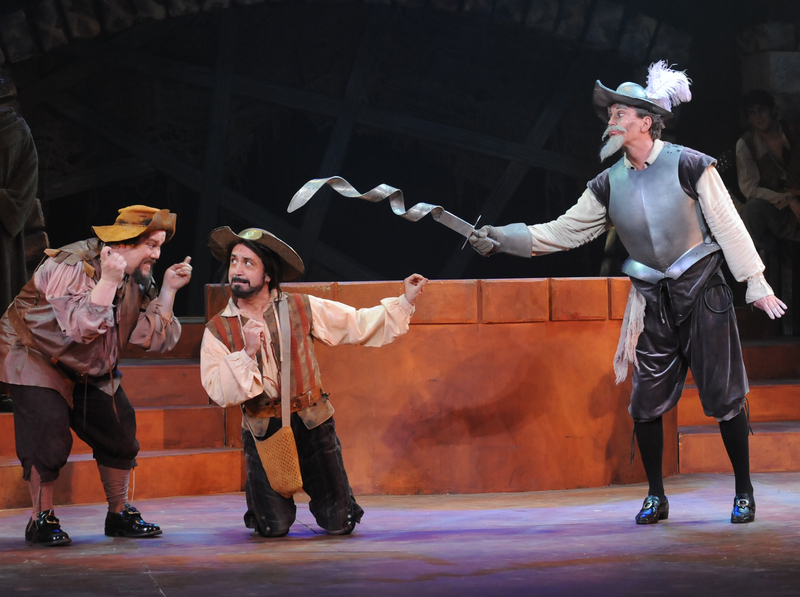 Assisted by his faithful sidekick Sancho Panza, Quixote pursues ’lofty undertakings‘, while seeking to win the favor of Aldonza–a beguilingly beautiful, yet savagely bitter kitchen maid, whom he takes to be his Lady, ‘Dulcinea‘–an angelic vision of virtue and loveliness that inspires his unending quest “To Dream The Impossible Dream”. Whether eagerly or reluctantly, all the inmates play their parts and from then on, the fable unfolds. Dispensing with the overture for a brief flamenco dance by the prisoners born of their frustration and desperation imaginatively sets the time and place while underscoring the ominous atmosphere of the opening scenes. Many of DeGruccio’s insightful touches like these border on brilliant, including the way he develops numerous comical elements (–frequently from the most unexpected sources) particularly during the first act. Then, when things turn dark in the second, that which would be seen as merely disconcerting is dramatic and devastating! Moreover, in emphasizing these bleaker elements makes the overall, hopeful (–dare one say ‘Quixotic“?) message stand out greater too. Similarly, Carlos Mendoza’s spirited and equally mood inducing choreography even has Quixote and Panza horses engaging in some fancy footwork! Not only does his work encompass dance but elements of stage-combat as well–witnessed by the muleteers’ callous ’retribution’ they mete out to Aldonza–all enacted as an unflinching Adagio. The innovative use of a turn table that serves as the center-piece of Set Designer/Technical Director Kevin Clowe’s set gives the staging a more ‘cinematic sweep’ while allowing the action to remain continuous with very few ‘black outs’ or disruptions, and his expansive backdrop is stylized just enough to suggest a multitude of locales, from a prison dungeon or the courtyard of a modest rural inn to a Spanish Manor-house. Perhaps his most impressive innovation though is a large, pendulous ‘lift’ that descends from the catwalks–stridently loud and mechanically primitive-looking, from which all of those incarcerated recoil in horror. This itself represents imminent doom, and its ever present threat literally hovers over the entire proceedings. Of course, the show is rightfully renowned for the majestic “Impossible Dream” and Gaines stately rendition here as the Act One finale ranks as one of the production’s most electrifying. However, to imply this is the only worthwhile song presented would be far too great a disservice to the rest of this lush, romantic score featuring music by Mitch Leigh and lyrics by Joe Darion, DeGruccio and Musical Director Matthew Smedal have wisely favored filling their chorus with plenty of dynamic “Musical Theater” voices over more intrusive ‘Operatic’ ones, thus serving their creation far better. This is especially important since many of the numbers act as soliloquies set to music, wherein the characters express their inner thoughts directly to the audience. Not surprisingly, these moments can be counted among the most poignant. 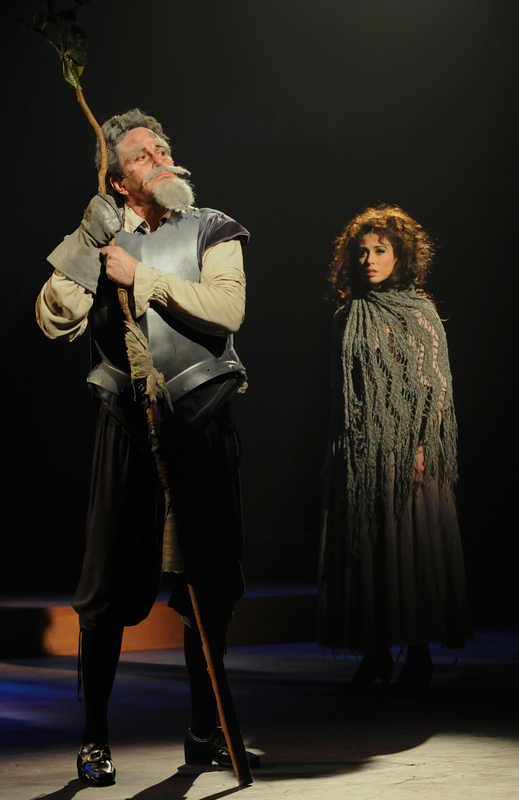 Take for example, Aldonza’s heartfelt, “What Does He Want From Me” during which she wonders “Why does he batter at walls that won’t break, why does he give when it’s natural to take?” and shortly thereafter how she vents her anguish at Quixote for having “shown her the sky–but what good is the sky to a creature who’ll never do better than crawl? !” At the other end of this harmonic spectrum are several delightfully humorous songs, such as when Quixote’s niece and housekeeper complain to the village Padre about the scandal news of the old Nobleman’s antics are reigning down on them–all the while insisting though, “We’re Only Thinking Of Him”. In a few cases, absurdity and pageantry combine so well that audience members can’t help but be caught up in it, as happens with the “Golden Helmet Of Mambrino”–a lively hymn of praise to a shaving basin that our balmy protagonist insists is a magical, gilded head-dress. Believing that it will grant him saint-like courage and virtue, before you know it, he has the entire chorus (not to mention us,) buying into it too! 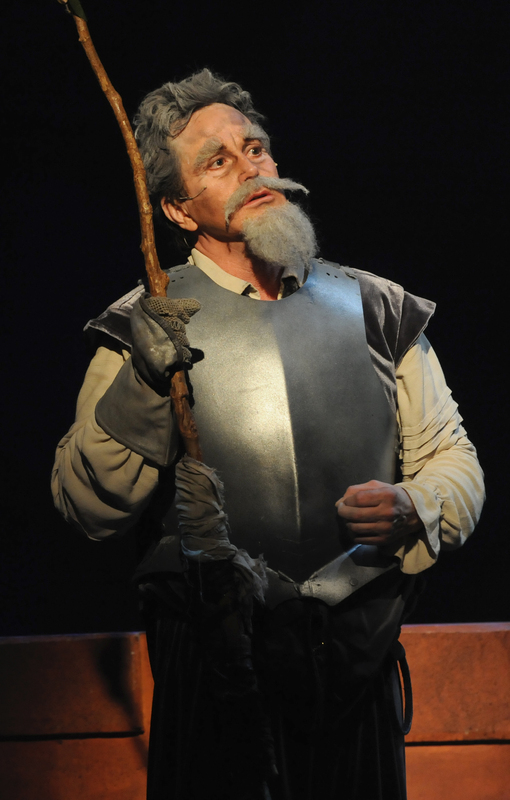 As the Gallant Knight-Errant of the title, Davis Gaines casts a giant shadow offering the kind of stupendous voice this role requires; but more than that, his take on both Cervantes and Quixote is so genial and charismatic that we’re not just ready, but eager to buy into even the most outlandish adventures. 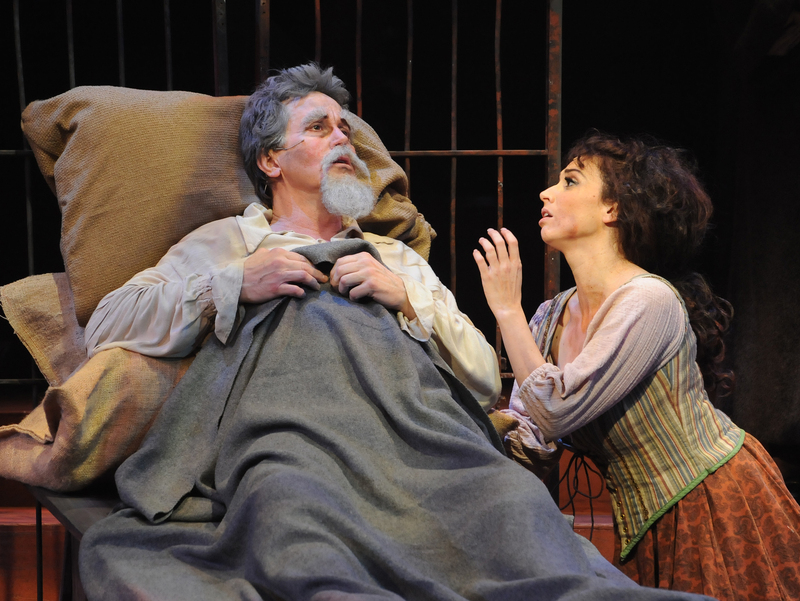 Matching him is Lesli Margherita, as the beleaguered Aldonza, who, in her introductory song tells us, “has seen too many beds but known too little rest”. Margherita’s voice is sultry, potent and nothing short of awe-inspiring. If Gaines serves as the show’s heart, she furnishes its soul. 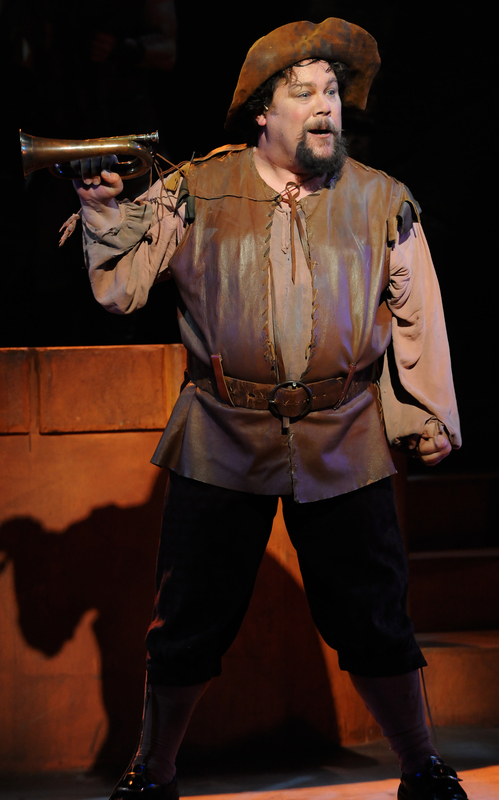 Likewise, as Sancho–Quixote’s proverb-spouting squire who faithfully “follows his Master til the end”, Justin Robertson avoids the slap-stick often associated with the part, choosing instead a mix of warmth, charm, and down right likeability, making all his scenes refreshingly believable. "You Spoke Of Dream-And About A Quest. You Must Remember!" 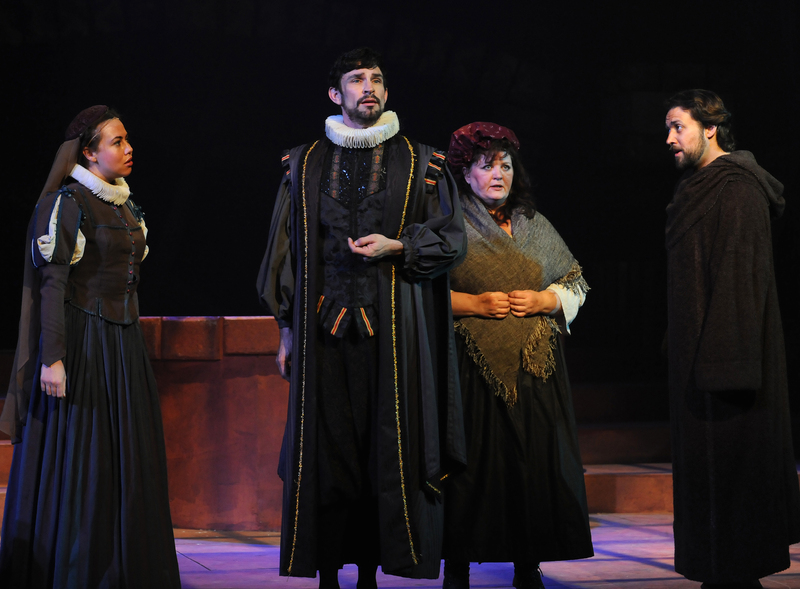 Also contributing terrific and tuneful support are Dynell Leigh as Quixote’s Housekeeper, and Karnessa Legear as his niece, Antonia, while Damon Kirsche is spot-on as Antonia’s groom-to-be, Dr. Sanson Carrasco–a pompous man of letters who “carries his own self-importance as if afraid of breaking it“. Clear and away the villain of the piece, it is he who ultimately shocks our hero out of his ’gentle insanity” by masquerading as “The Knight Of The Mirrors”, forcing the old man to see how foolish he really is. In addition, Jason Webb’s ‘Padre’ makes the most of an all-too-commonly overlooked role, demonstrating a pleasant, ‘folksy’ quality with “To Each His Dulcinea” (–a meditation on dreams vs. reality, in which he finally reminds us, “the man with moonlight in his hands has nothing there at all.”) Later, he furnishes some sincere, moving vocals with “The Psalm”. ""Where Ever I Ride, Ever Staunch At My Side, My Squire And my Lady Shall Be..."
All Photos By Ken Jacques ( www.kjphotography.com ) Courtesy of Musical Theater West; Additional Thanks To Paul Garman, Gigi Fusco-Meese And The Cast Of Musical Theater West’s “Man Of La Mancha” For Making This Story Possible. This entry was posted in Theater reviews and tagged "Man Of La Mancha", "The Impossible Dream", 1966 Tony Award Winners, Aldonza, California Theater, Carpenter Center For The Performing Arts, Dale Wasserman, Davis Gaines, Don Quiote, Dulcenea, Joe Darion, Lesli Margherita, Long Beach CA, Mitch Leigh, Musical Theater, Musical Theater West, Sancho Panza. Bookmark the permalink.